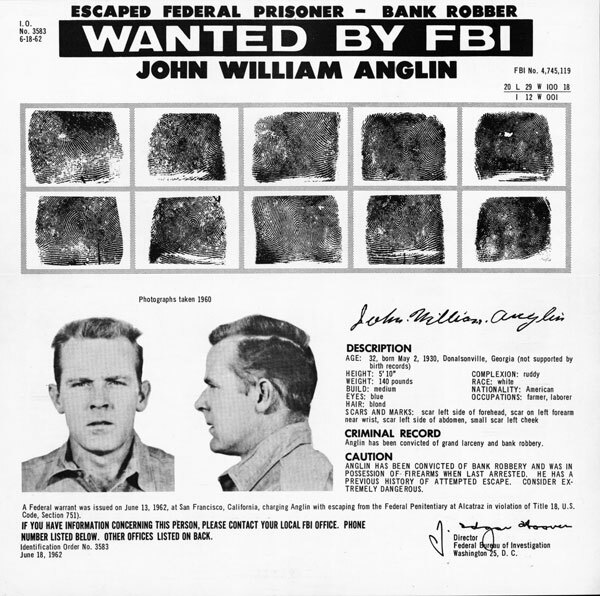 John Anglin was one of three bank robbers who successfully escaped from Alcatraz Federal Penitentiary, “The Rock” in San Francisco Bay. Whether or not Anglin escaped the bay itself—much less wrote a letter asking for financial assistance for medical aid—remains a mystery. A television station in San Francisco has a letter claiming to be from John Anglin, one of three men to have escaped Alcatraz Federal Penitentiary in 1962. Why is this notable? Read through our fun little article for some help. John Anglin, his brother Clarence, and Frank Morris broke out of their cells on the night of June 11, 1962, and were never seen again. The men were the only prisoners ever to have escaped from Alcatraz. Follow possible trajectories of the raft launched from Alcatraz in 1962. Angel Island lies to the north of Alcatraz, while the Golden Gate lies to the west. San Francisco Bay is very cold, very foggy, and very hazardous. Strong currents rush from the shallow estuary through the narrow Golden Gate itself. (The Golden Gate is the strait between the bay and the Pacific Ocean. Yes, it has a pretty red bridge on top of it.) Beyond the Golden Gate are some of the strongest rip currents in the world, the largest stretch of open ocean on Earth, and, uh, aggressive great white sharks. Why do some historians think escape may have been possible? Take another look at that gorgeous map above. There is an escape route. The model shows that with the right knowledge of currents and tides, a raft—even a flimsy one made of raincoats—might have made it to Horseshoe Bay, an inlet on the San Francisco Bay’s north shore. Horseshoe Bay is further from Alcatraz than Angel Island, but navigating there could take advantage of tidal flow patterns. “To escape and survive, the inmates would have had to launch during a narrow window between 11:30pm and 12 midnight. If they did, the findings suggest the inmates could have ridden the outgoing tide.” The inmates broke out late at night, so this is not implausible. Do experts think the letter claiming to be from John Anglin is actually from John Anglin? The Marshals Service, the only agency that still has an active investigation in the case, said it has doubts about the letter’s authenticity. “There is absolutely no reason to believe that any of them would have changed their lifestyle and became completely law abiding citizens after this escape,” the agency wrote. Could this be a job for citizen sleuths?! Some of the most coveted real-estate in America?